I love photographing frogs because of their big eyes and also because they are very important for the ecosystem. However it can be frustrating to attempt photographing them because they often jump for the safety of the water before you even saw them ! 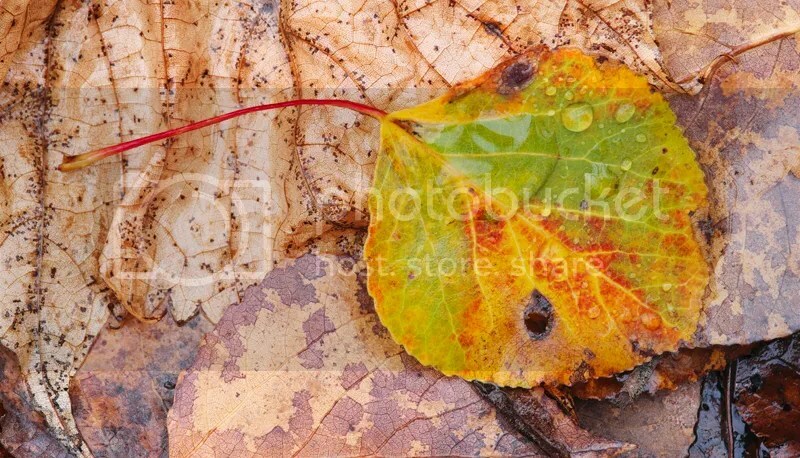 In this article i will share with you what i’ve learned about photographing them so that you can try it out yourself and get good results. The temptation is high during the warm summer months to head to your nearest pond wearing a T-shirt, shorts and a pair of sandals, but ………. MOSQUITOES and their friends are waiting for you and they can drive you crazy !!! !A hat is a good help to keep the insects away from your head, but this summer i will add gloves and also a net that i will put over my head to protect my face, ears and nose. I don’t use insect repellent because it’s not the friend of the plastic of my camera gear. So my minimum kit is long sleeves shirt, long pants and a pair of knee high rubber boots. 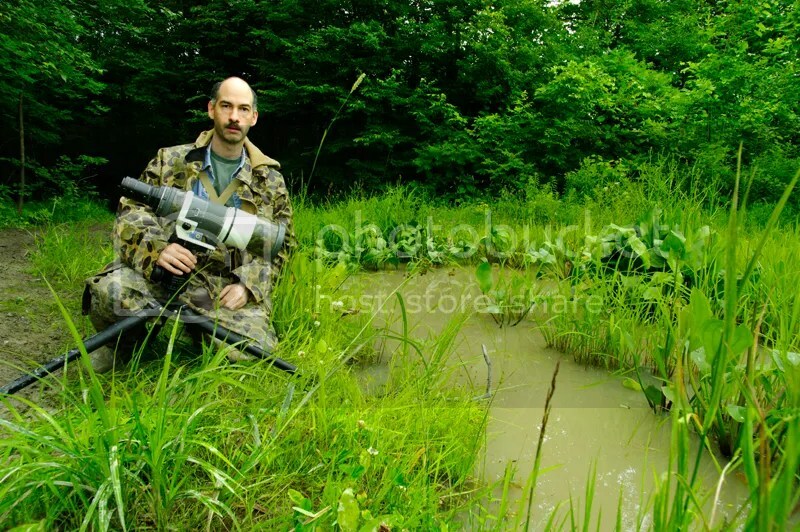 Then if needed when i’m shooting at a pond with muddy shores i will add a complete rain suit. Waders are also a very good option but i never needed them so far, but might add them to my kit eventually. I was getting ready to photograph the frogs with my full protection kit . This place is a Mosquito paradise during the summer months !!! Just a short talk on useful camera gear, the majority of my photos are taken with only two lenses: a Macro lens in the 90mm to 105mm range and my 400mm lens that i use with or without extension tubes. I prefer a Macro lens in the 90 to 105mm range because they allow a good working distance but they are also easier to handhold than longer Macro lenses. 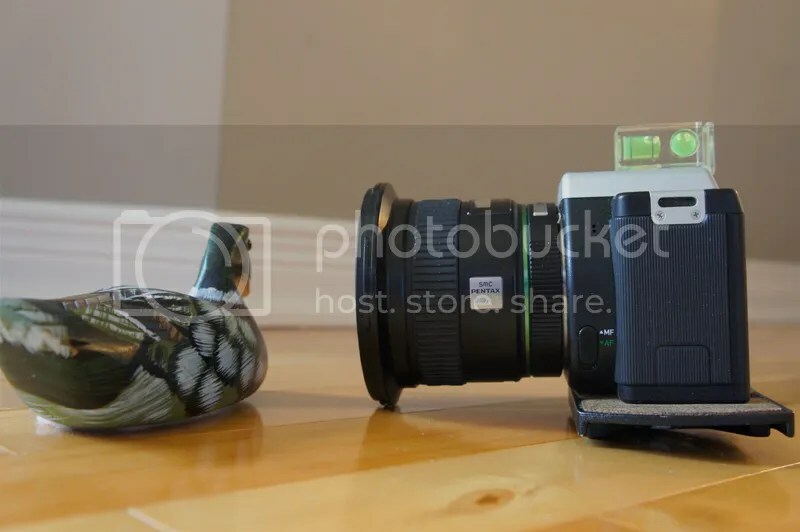 I suggest to have one with Image stabilization or a camera with IBIS like the Pentax SR (shake reduction) since i mostly shoot handheld while photographing frogs. My 400mm lens is nearly always used on a solid tripod but i can sometimes use it directly on the ground. A long lens comes handy when frogs are too nervous to photograph them with my Macro lens or when i can’t get physically close enough. When using my 400mm lens on my tripod i will submerged it in the water as deep as possible to get my camera as close to the water surface as possible to get that eye level position. Over the years i also used different lenses, even my 14mm lens or a telephoto zoom like a 70-200mm or a 55-300mm can be used with good results. 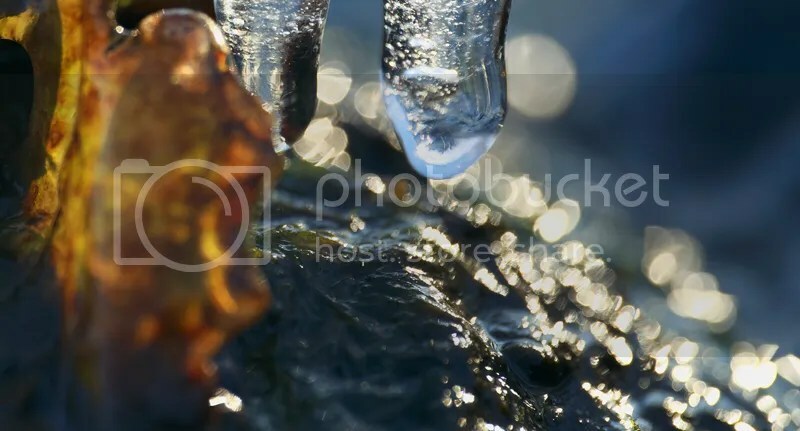 A piece of gear that is very useful is a bubble level that you put in the hotshoe of your camera or you can use the electronic level when using the LV of your camera. This is the model of bubble level that i sue in my cameras hotshoe. I like this model because you can use it for horizontal and vertical composition. I took this photo last summer during our family vacation while we were canoeing on the lake at my parent’s summer cabin. It took a couple of times to find a cooperative bullfrog that would let me close enough to get it’s portrait with my 14mm lens. Unfortunately my Fuji X-E1 and it’s XF 14mm lens don’t have any IS, so a fast enough shutter speed was necessary to compensate for the movement of the canoe. Most of the time you want to photograph the frogs at their eye level like you would do for any other wildlife subject. 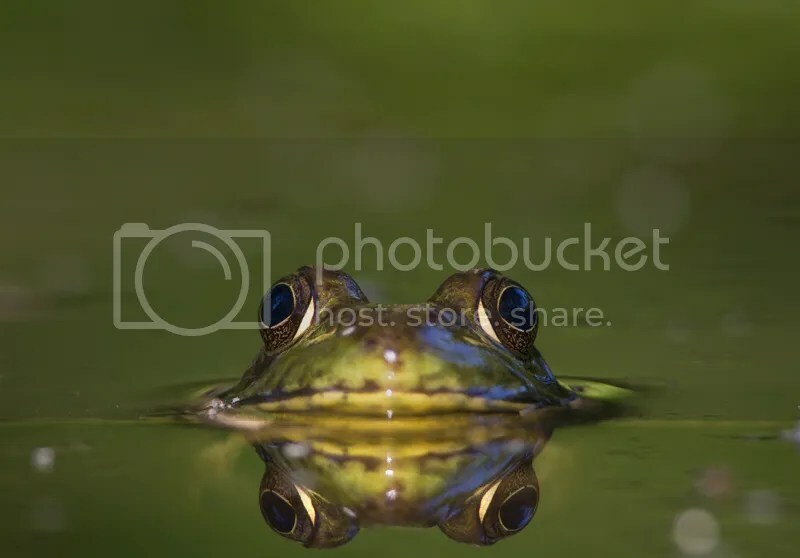 Sometimes when my subject allow it and it’s surrounding is interesting i will try to photograph it directly from above like this Green frog shot above. 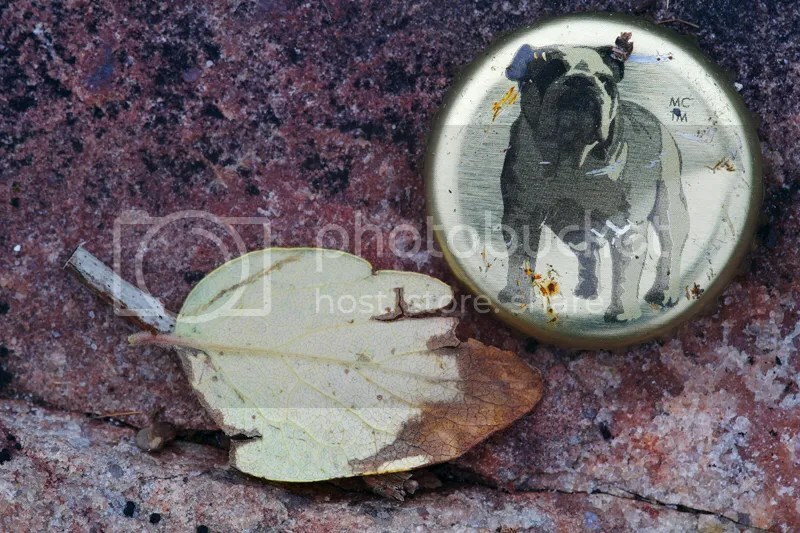 I always have at least one Macro lens with me, in this case it was my Pentax DA 35mm Macro Ltd. 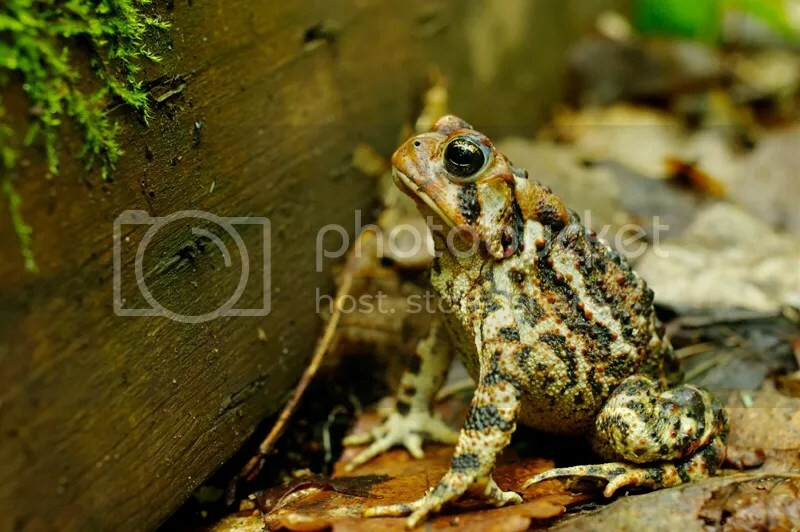 This photo of an adult American toad was taken along a trail while i was on vacation with my family. Again , i was handholding my camera low to the ground and used SR to help me get a sharp shot. 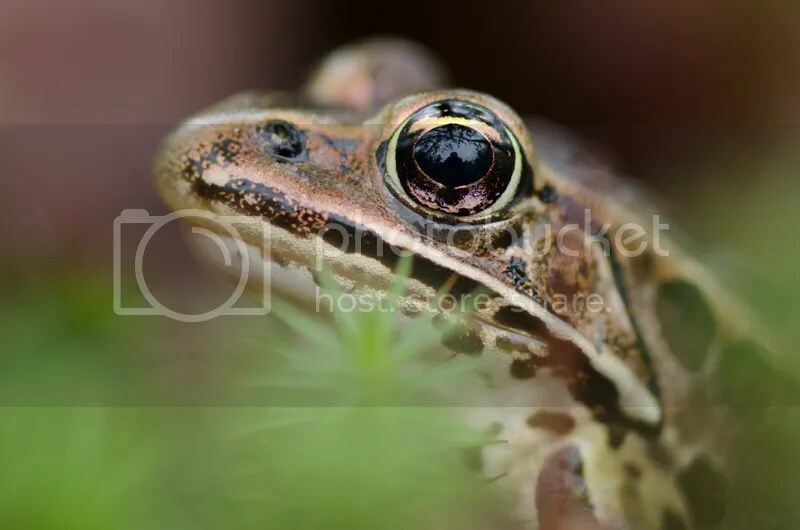 Don’t always try to get only frame filling shot of a frog head, backing off a little and show them in their environment is also important and bring variety to your portfolio. 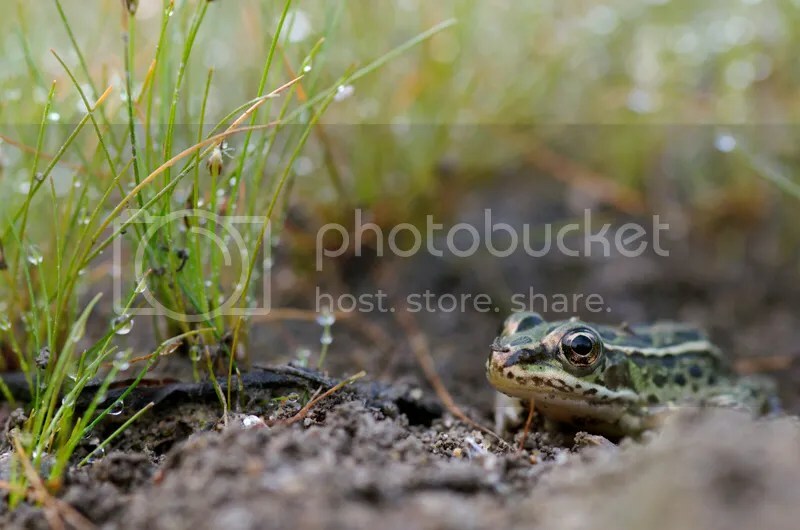 Here it’s a young Leopard frog surrounded by vegetation covered with water drops. I got very low to the ground and put some OOF foreground in the lower part of the frame to add some depth. Usually the best way to photograph frogs is from the side are directly from the front but i also like to take them from various angles. 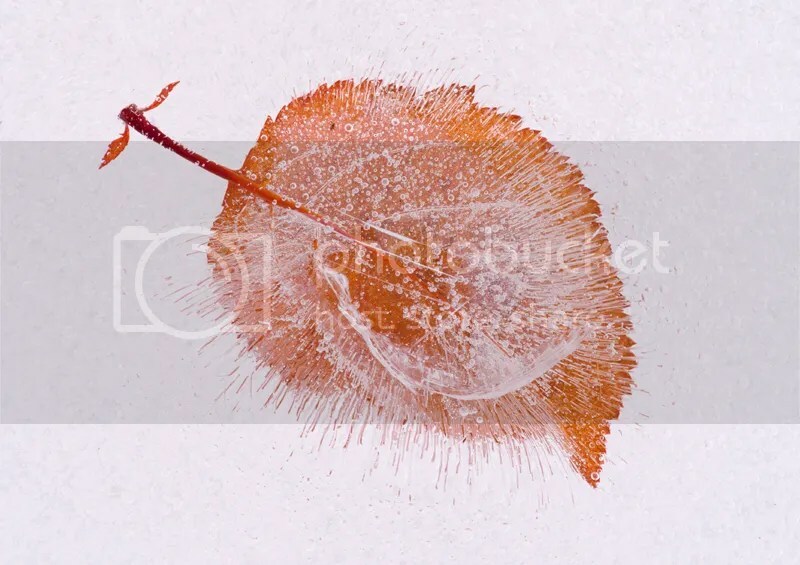 For that photo i did put my camera and 400mm lens equipped with extension tubes directly on the ground and used a towel to level my camera with the help of a level in the hot shoe of my camera like i’m showing in the video in this article. When shooting directly face to face i will focus at midway between the front of it’s eyes and the top middle of them and stop my lens down to around f/8-11 if possible. Now the part that you’ve been waiting for. How do i get close to them on a regular basis ? I do encounter a lot of frogs that quickly jumps into the water before i’m even close enough to them, but patience is the key element here. If you wait on the shore most of them will get back to the surface sooner than later and often nearly at the same place or not very far. Frogs can be easy to get close at a particular pond but nearly impossible to do so at another pond. 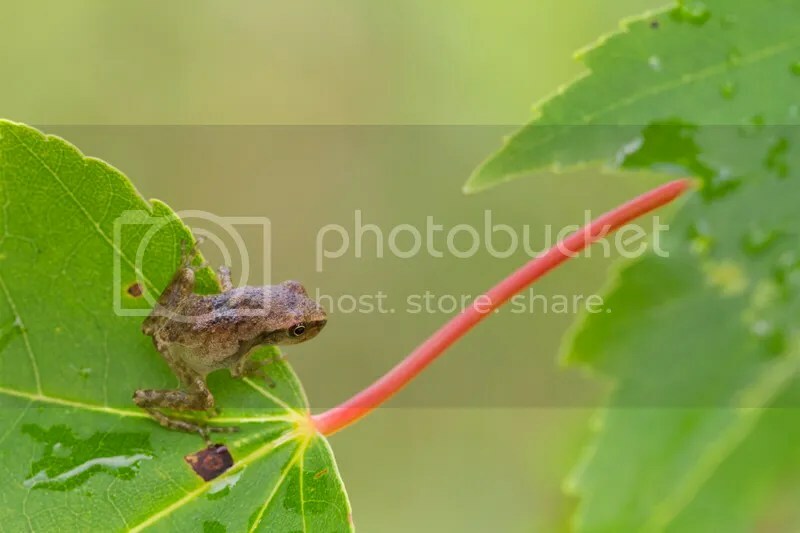 Some species are more tolerant like the young Gray Tree frog and adult American Toad, while Wood frogs and Leopard frogs are quick to jump everywhere and are more difficult to photograph. 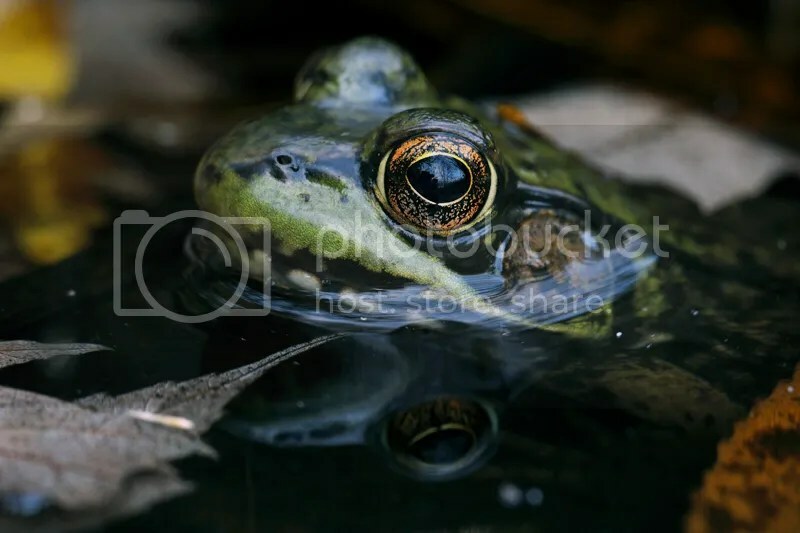 When i’m photographing Green frog at my favorite pond there is some individual that are easier to get close with my Macro lens or even a wide angle lens, by going often during the same season i come to know and identify which one is the easiest to photograph. 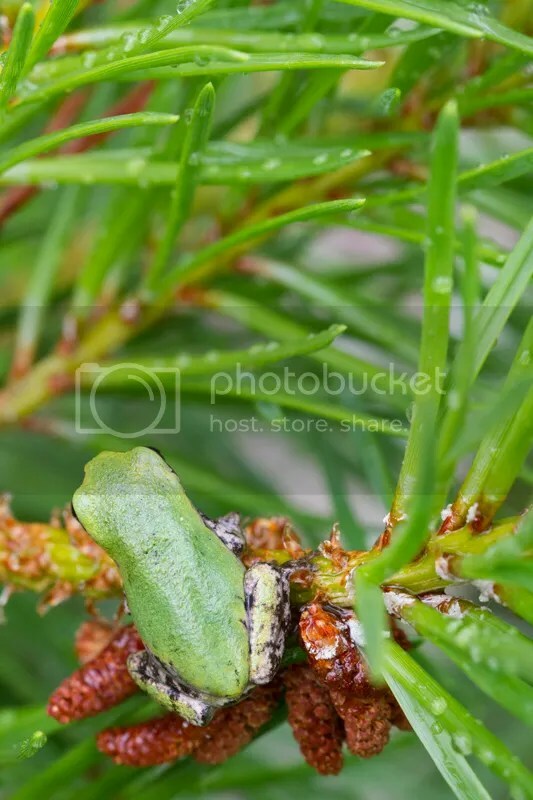 Gray Tree frogs are usually found in trees or hiding in the vegetation, so i prefer to use my Macro lens handheld as it is easier than trying to position a tripod. On some occasion i will use a tripod if i can but it’s not the majority of the photos i take. 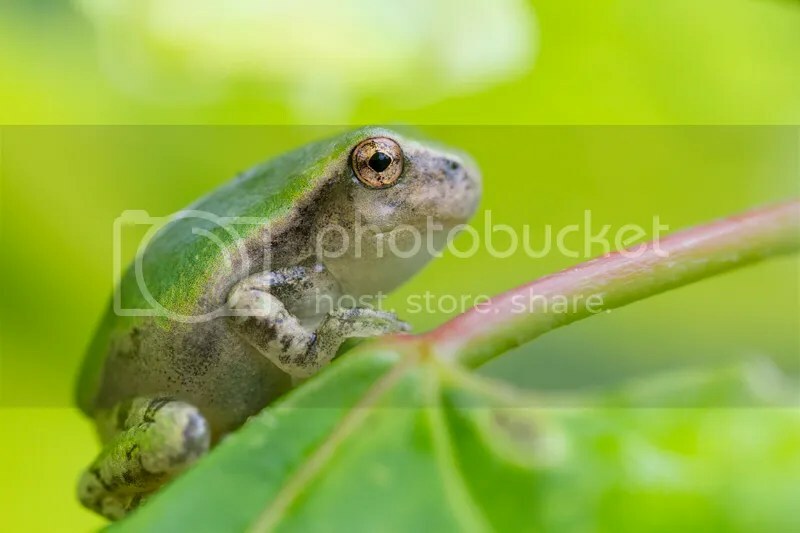 The young Gray Tree frog are very small and hide in the vegetation, the background is often very busy , so you need a shallow DOF to blur it as much as possible to eliminate the distractions. I usually use an aperture of f/4.5 to 6.3 most of the time and it will also give me a faster shutter speed since i’m shooting handheld most of the time. This young Gray Tree frog is the king of it’s world. Taken handheld with my Canon 7D and Tamron 90mm Macro VC. Having some kind of image stabilization is a must for photographing frogs. Adult American Toad are easy to photograph because they are slow and they often don’t move. But they are young it’s another thing, they don’t jump very far but they usually don’t stay very long at the same place. 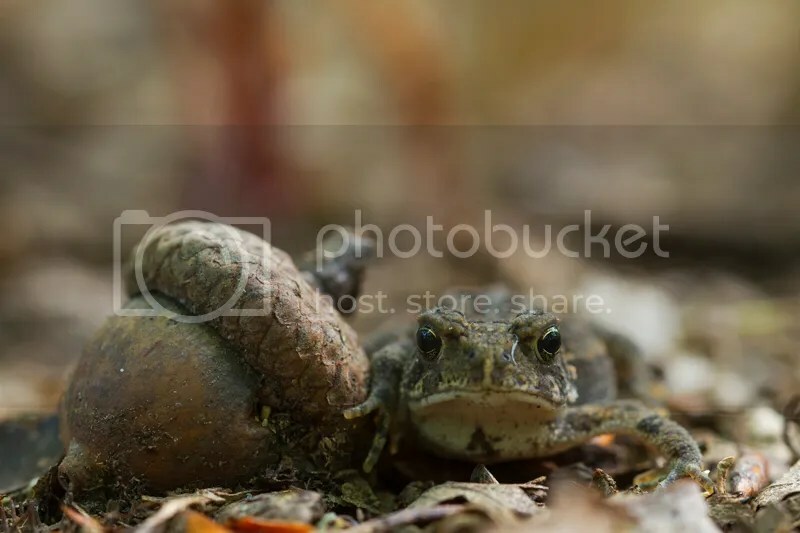 This young American toad is very small, to take it’s portrait i positioned my camera directly on the ground and used a remote release to trigger the shutter. I want to talk shortly about the settings, even if the frogs looks like they are very still in the water in reality they aren’t. Just by breathing they slightly move up and down when they are in the water, so you will need a shutter speed fast enough to stop that movement. Usually i try to have a shutter speed of at least 1/30 sec. but i can get away with 1/15 sec if the frog doesn’t move too much or if it’s hanging with it’s front paws on some vegetation. This is it for this first article, will post other ones probably with videos of in the field footage when the season will begin. Hope it will help you get better photos of frogs. Sigma 180mm/5.6 APO Macro, my first impressions. Why this old and slow Sigma 180mm/5.6 APO Macro lens ? When i bought a Fuji X-E1 it was to have a smaller and lighter system, so i try to keep the lenses small and light as well without compromising the IQ. The Fuji short registration distance is an advantage when you want to adapt older lenses. I already own a Tamron 90mm/2.8 Macro (1:1 ratio), so i wanted a longer Macro lens for photographing frogs or subjects that are difficult to get close. Then i remembered that Sigma did produced a 180mm/5.6 APO Macro in the film days. I was lucky to find a MF version in Olympus OM mount in good condition but without the lens hood, so i bought a rubber hood for it. I paid around 170$ Canadian for it, a good price for a Macro lens that long. Sigma didn’t produced many of these probably due to the slow maximum aperture which was not that useful in film days when slow films were the norm to obtain better IQ, the f/2.8 version was probably more popular. But now with digital sensors a slow lens is more manageable, especially for a 180mm Macro lens that will be stopped down anyway to gain some DOF. At only 435 gr. and a filter size of 52mm it’s a surprisingly small lens, if you compare it to my Tamron 90mm/2.8 Macro (model 72E) which is a 1:1 repro ratio lens and weights 403 gr. 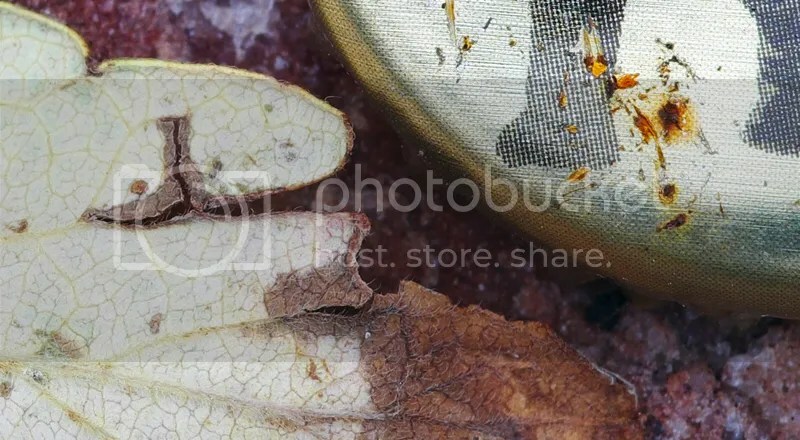 with a filter size of 55mm. Both side by side, the Tamron is at infinity focus so it’s at it’s shortest length. It’s clear that in those years Sigma lenses were not the best made lenses, i’ve owned other Sigma lenses made in the same years as this one and they all felt like this one. Good but not as well made as Pentax, Fuji or Canon that i’ve used. The aperture ring is not smooth in operation, but i can live with it, if i drop that lens i think it would not survive unlike some of my older Pentax lenses especially the Takumar M42 lenses ! The positive thing is that the focusing ring is large, which i like to have on my lenses, i hate those tiny small focusing rings that some AF lenses have. On my lens the focusing ring is not constant, when i turn it it goes from smooth to some tension and then back to smooth, maybe it would need some tune-up of the focusing system inside. In general it’s easy to use with the OM adapter on my X-E1 because it’s a lightweight lens, if i would have bought the newer 180mm f/3.5 version the combo would have been bigger and heavier. 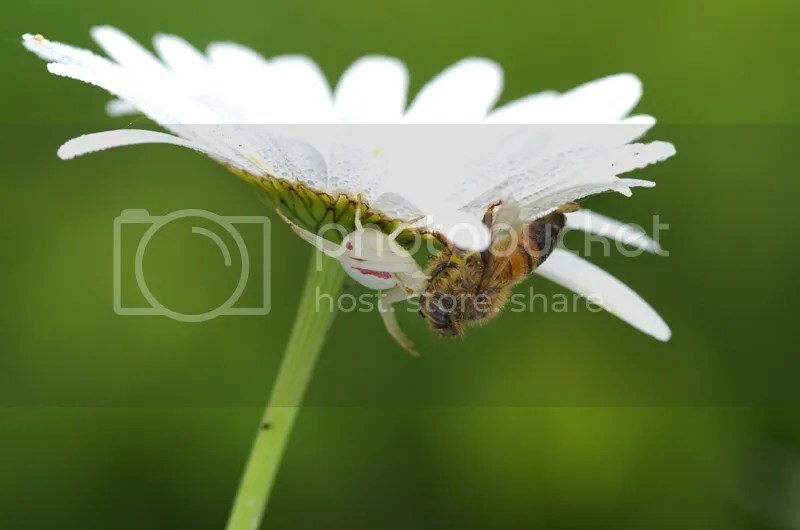 Usually Macro lenses are sharp and choosing from one or another one is a matter of functionality but also of focal length. This Sigma certainly can deliver images with very good details when stopped down. At f/5.6 i think it’s the weakest aperture of that lens, but from f/8 to f/16 the lens produce very good images. Being an older lens that was design before the digital era, the contrast is lower than modern Macro lenses but it’s easily corrected in PP. Just for fun i decided to take some test shots with this Sigma 180mm and my Tamron 90mm/2.8 Macro (model 72E) to really see how good it really is. 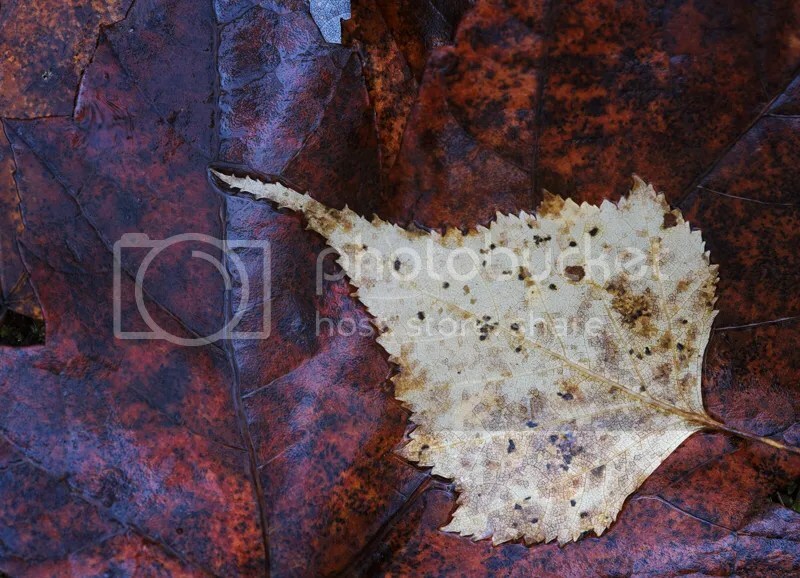 I found dead leaves in my backyard as my subject and started at f/5.6 then f/8, f/11 and finally f/16. I was not surprised to see that the Tamron was the winner at f/5.6 since it was already stopped down 2 stops and the Sigma was W/O, if needed the Sigma can be used at f/5.6 since it’s good but not as good as the Tamron here. From f/8 to f/16 the Sigma closed the gap but i think the Tamron can still produce a little more details, but the Tamron 90mm Macro is one of the best Macro lens, in any of it’s versions that was made. Even then i think that the Sigma is more than sharp enough from f/8 to f/16 to be used without any problem, you just need a little more PP to bring some contrast in the photos. As for the color reproduction, the Sigma has a colder rendering than the Tamron but again now with PP it’s easily corrected to your preferences. The Sigma can produce images with beautiful rendering and the Bokeh is not too bad either probably due to it’s 8 blades diaphragm. 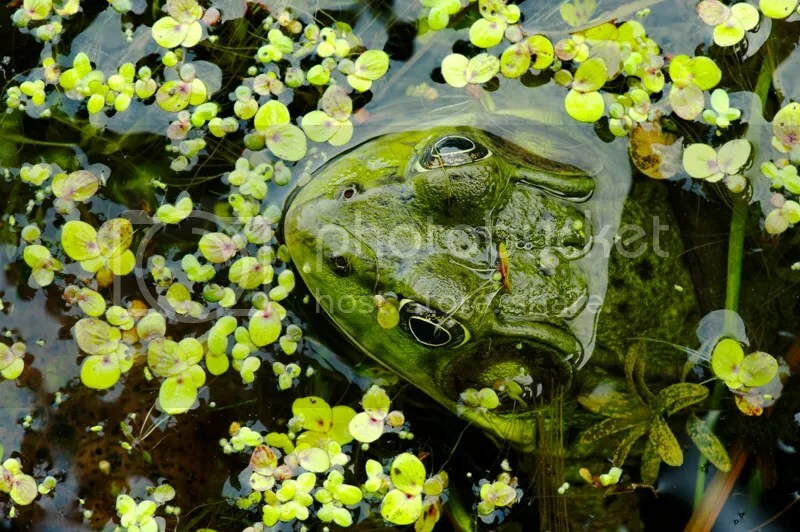 This Green Frog was taken in a shallow pond, my tripod was nearly all in the water to get that view. I printed that photo at 8×10 inches and there is plenty of details, sharpness is very good for that size and i wouldn’t hesitate to print it bigger than that. Taken at f/8. 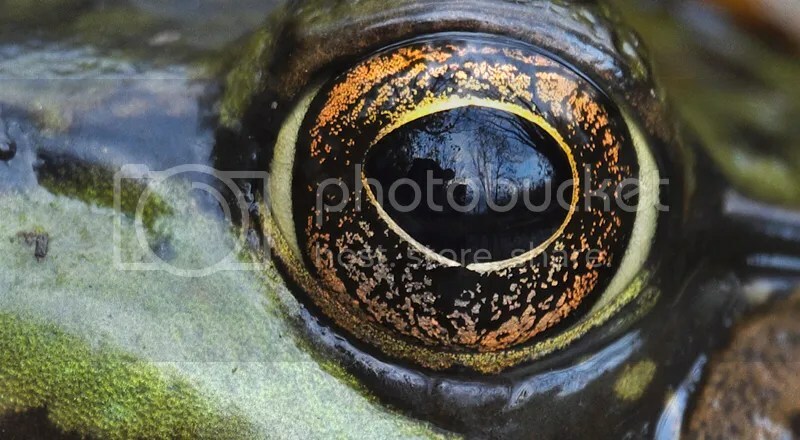 Here is a crop of the eye of the frog from the above photo after some PP, very good details in the eye. 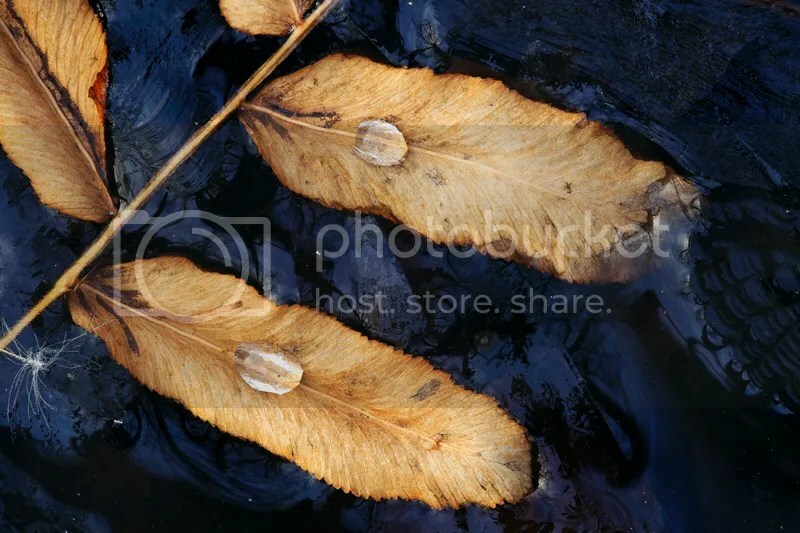 For this photo i used a Polarizer to cut some reflections off the leaves. Taken at f/13 on a tripod. 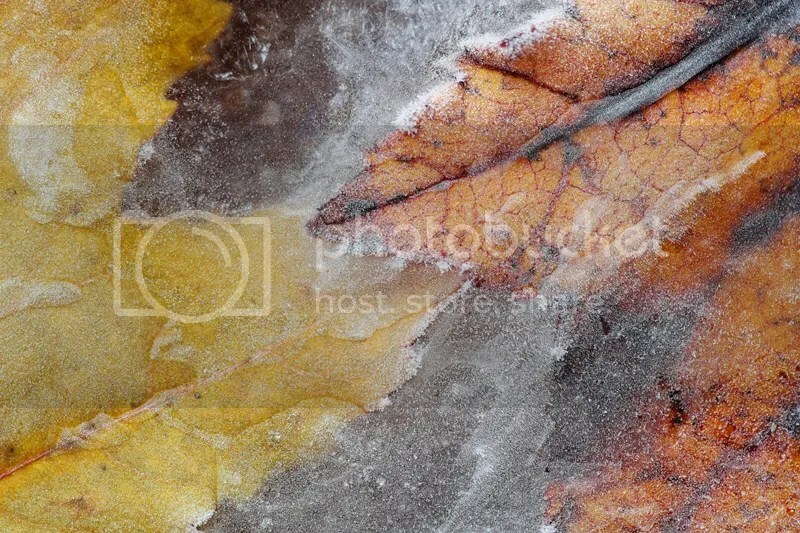 Leaves frozen in ice with frost. Taken with the help of a 10mm extension tube at f/11 on a tripod. Taken at f/13 on a tripod. Crop from the above photo after some PP. That’s it for now, they are my first impressions after some weeks of using it in the field, i will post more photos in future articles. So, if you need more reach in your Macro work but don’t want to break the Bank, give this lens a serious look. The Sigma 180mm/5.6 APO Macro might not be the best in any department but certainly can deliver sharp and beautiful images when you have learned how to use it at it’s best settings. Sure the newer f/3.5 and f/2.8 versions from Sigma would certainly get you sharper photos but at a big cost in size, weight and price (especially the new f/2.8 version). So if you’re on a tight budget or don’t want a heavy 180mm Macro lens this f/5.6 version can be a very good option. 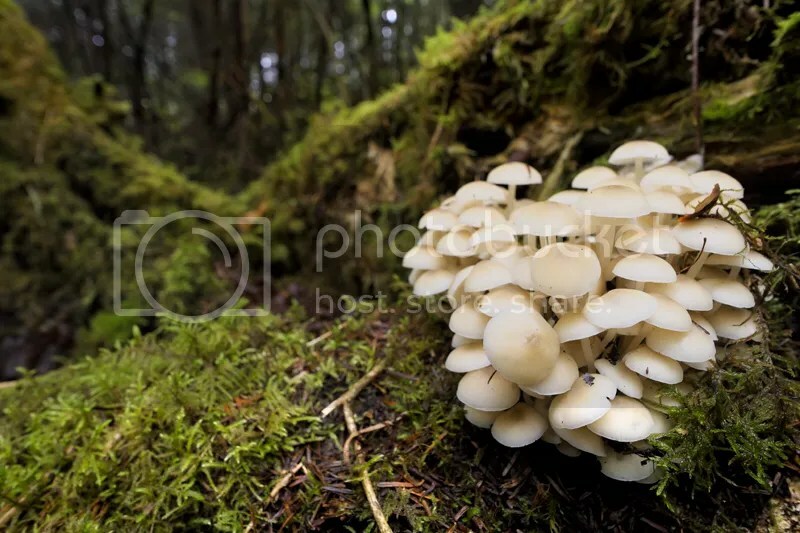 Wide angle lenses for close-up photography ! Usually when we talk about close-up photography we think of using a Macro lens but a WA lens can give you a different perspective. Unfortunately there isn’t that many WA lenses that can focus very close. 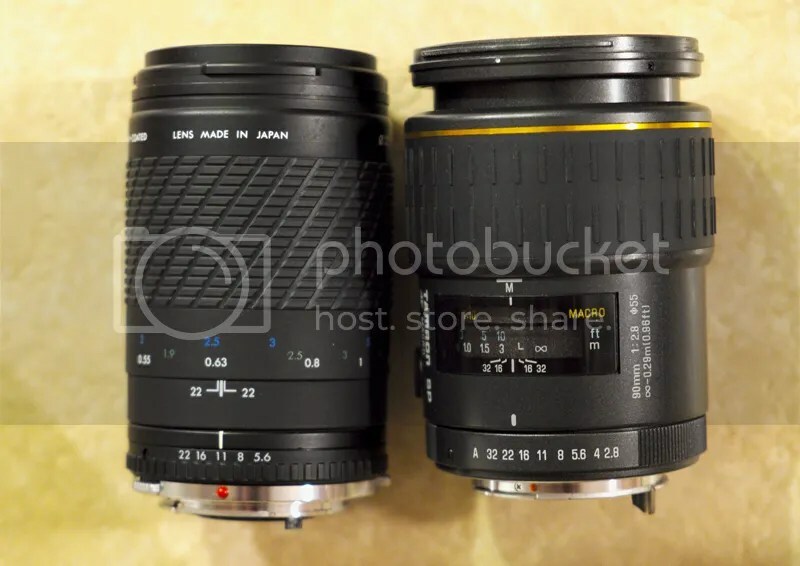 Sigma is making or have made a 24mm and a 28mm “Macro” lenses but i’ve never tried them, they can focus down to 0.18 Meter and 0.20 Meter respectively and giving a reproduction ration of 1:2.7 and 1:2.9. The lenses that i have more experience with are two 14mm lenses that focus closer than other manufacturers 14mm lenses … the Pentax DA14mm and Fuji XF 14mm. The Pentax can focus down to 0.17 Meter (repro ratio of 1:5) and the Fuji to 0.18 Meter (repro ratio of 1:8), both are APS-C lenses only. From the official numbers the Fuji doesn’t have a magnification as high as the Pentax, that 1 cm closer focusing of the Pentax makes a big difference or it’s something in the lens design that results in a big loss of magnification. If someone know the answer don’t hesitate to post it below. A last point, the Pentax have the advantage of having SR (Shake Reduction) in the cameras, i think that any kind of image stabilisation is useful even with a WA lens. Sometimes you’re shooting handheld at arms length and every help you can get is welcome. Sure you can boost the ISO but there is a limit when you want to maintain IQ. Here is how close the Pentax DA14 is to the subject at it’s minimum focusing distance. Enough of the technical talking, now in the field with those 2 WA lenses. 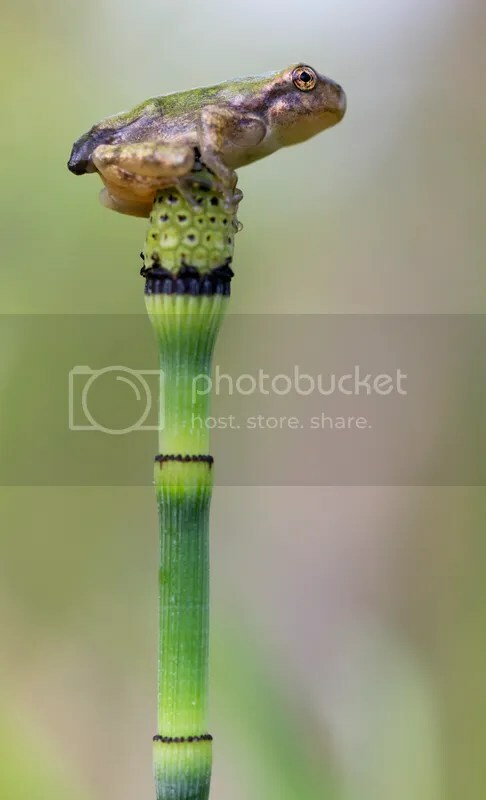 They are both great lenses at their minimum focusing distance, i used them especially for photographing close-ups of frogs but also for flowers and mushrooms. 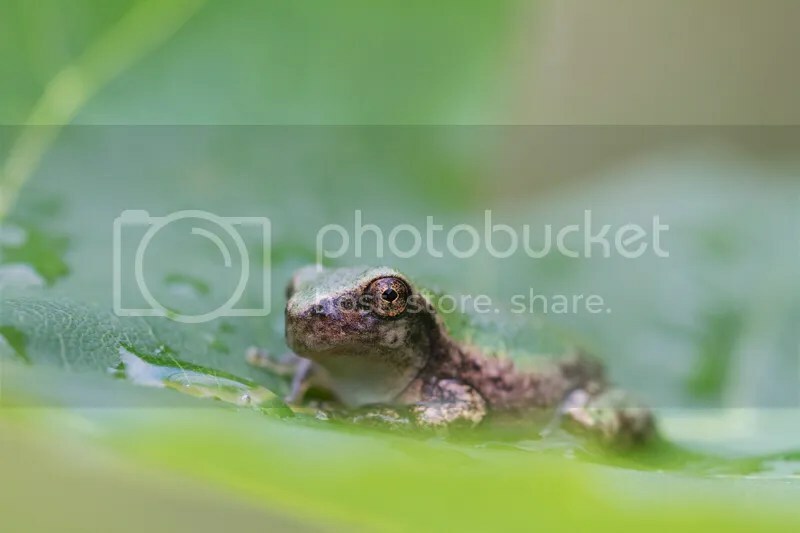 When i’m using a 14mm lens for taking close-ups of frogs i don’t put the hood on the lens because it almost touches my subject and can scare it away. With some practice you get to know which frog will let you close enough to have a good shot. 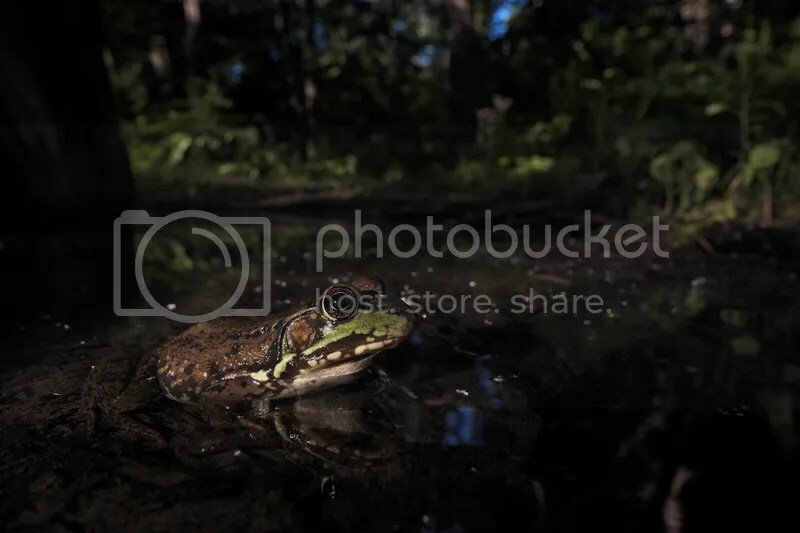 This Green Frog was taken near the minimum focusing distance of the Fuji XF 14mm at f/8 on an X-E1. 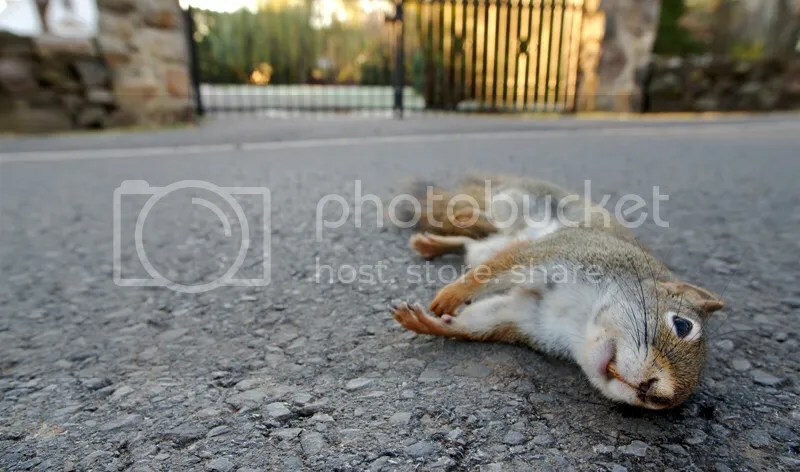 One from the Pentax DA 14mm at f/7.1, sorry about the dead Red Squirrel but i like that photo because it shows that wild animals are always in danger even in our towns. 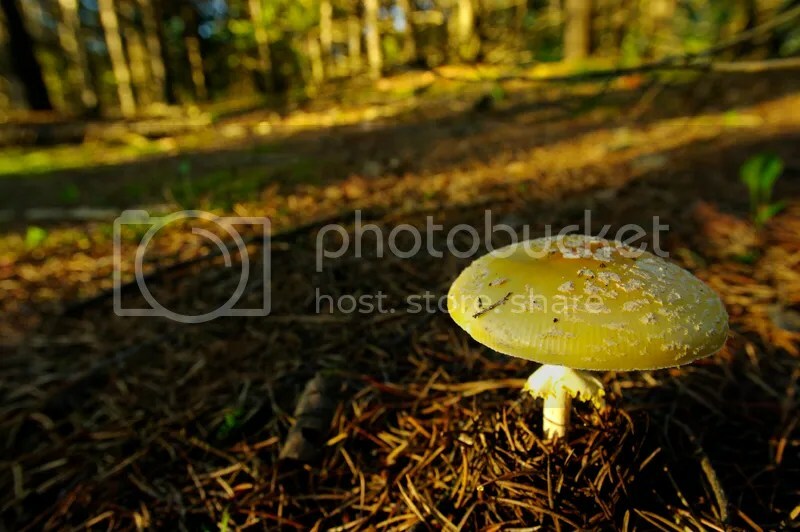 Mushroom in it’s habitat taken with the Pentax DA 14mm. 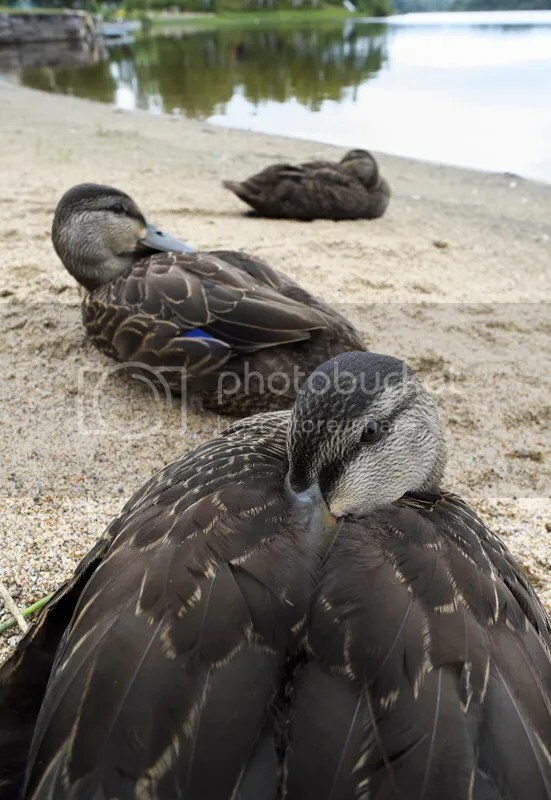 This photo was taken at my parent’s summer cabin, they are wild young Black Ducks but peoples around the Lake gave them foods since they were very young when they came with their parents. I was able to get really close to them by getting down on my belly. Taken with my Fuji XF14mm at f/9.0, some even tried to eat my fingers or X-E1! I prefer to use MF at close distances, especially with the Pentax K-01 and Fuji X-E1 because of the Focus Peaking which makes it easy to get perfect focus. It takes some practice to get good composition and don’t forget to get very close to the subject so your shot will have more impact. With a WA lenses you get a lot of things into the frame so you have to pay attention to the background and the corners, because you will see things in your photo later that you didn’t saw when you took your photo, so look carefully in the field to be sure you can remove or recompose to get the distracting objects or plants out of your frame. 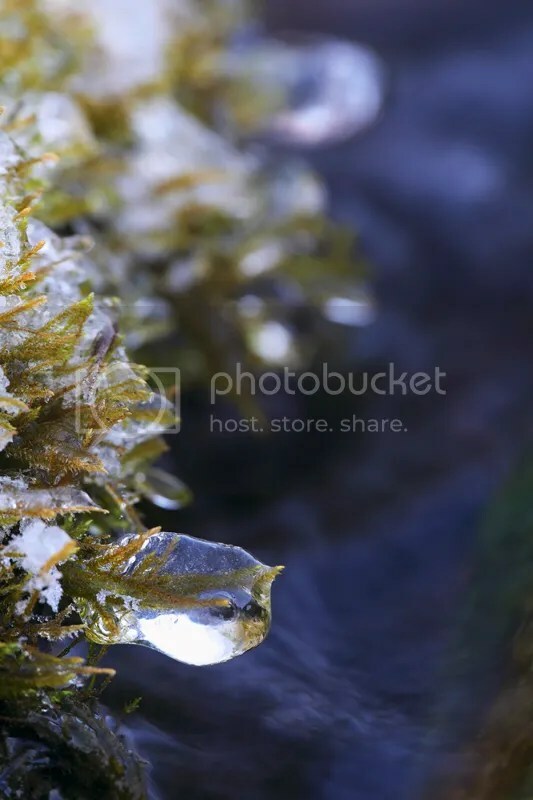 So get close and down to the level of your subject and have fun while getting interesting perspectives! Since i liked my National Geographic bag (2342) i looked at other models from this brand as well as other brands. After some research i decided to pull the trigger on the National Geographic A2540 Midi Satchel ” Africa Series ” bag. In the photo above you can see the size of the bag compared with my Fuji X-E1 + XF27mm. On this Tag you can write your name, address and phone number in case you loose your bag somewhere. The prices on the site or in Canadian dollar but you can select another country. I didn’t pay that price, i found a store here in Canada that was selling them for 50$ (in sale), so i didn’t hesitated very long. I also bought the shoulder pad to go with the bag, … it’s stiff , i tried to bend it and form it to my shoulder but i still don’t find it comfortable . The bag is made of very tough material and it feels like it can survive anything you can throw at it, so it should be with me for many years to come. The bag is not rated as waterproof but i used it in light rain without any problems, if you need it to be fully waterproof there is a waterproof cover available. What i like about this bag is that all the pockets and the main compartment are closed with a zipper which is great to protect the equipment from rain and dust, some bags have just the big flap with 2 buckles to close the main compartment. 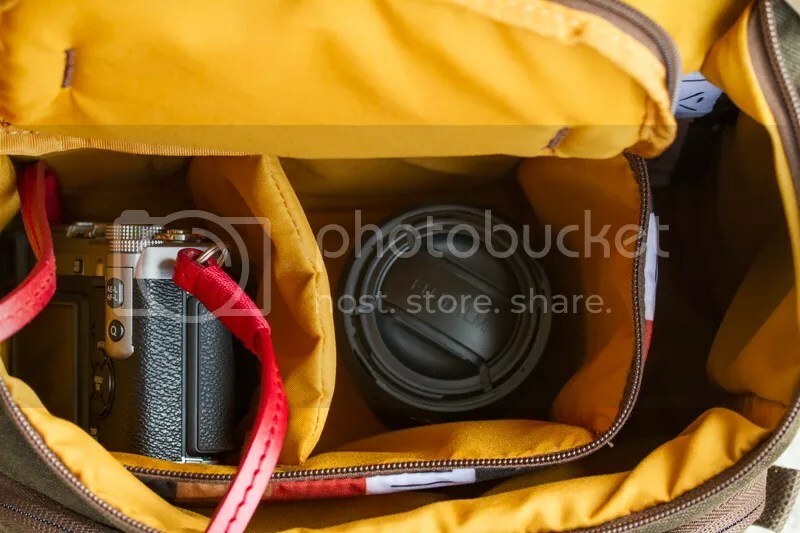 As you can see in the link of National Geographic there is a removable insert bag which contain the camera and lenses and can be removed from the bag to make it a regular bag. I can fit my Fuji X-E1+XF 27mm and my XF14mm (or 18-55mm) as well as some SD cards in a Ziplock bag and a dust blower. Even with the insert in position in the main compartment of the bag i can also fit my Vivitar 100mm/3.5 Macro in the remaining space. Inside the bag there is another compartment to fit an Ipad or a small Laptop. I don’t use it for this but i fit my Extension tubes, cable release and quick release plate just in case i would need one of them. 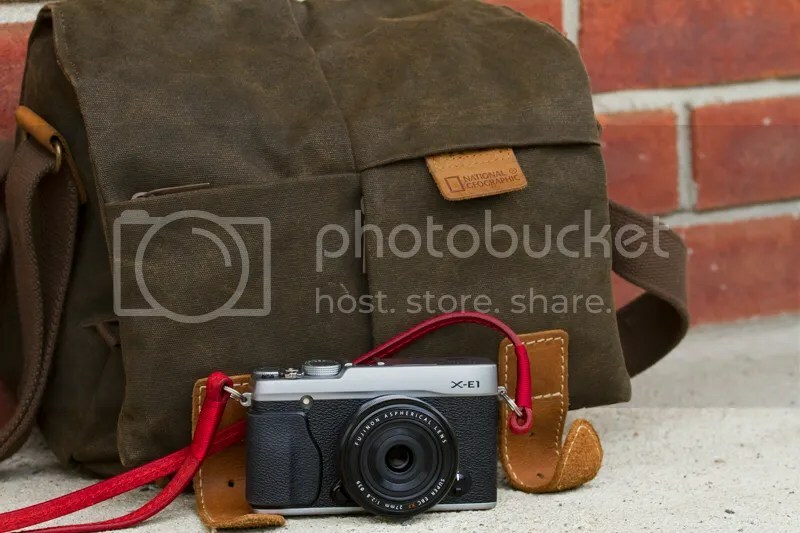 In the photo above is my X-E1 + XF27mm, in the second compartment it’s my XF14mm, both in the removable padded bag. You can see that there is a place on the far right for another lens, i sometimes put my Vivitar 100mm/3.5 Macro (in Pentax K-Mount). I’ve been using it as my everyday bag for some weeks now and i really appreciate it, feel solid and for my needs it’s a good size without being too big and heavy. I’m now used to get my camera quickly out of the bag, the zippers feel solid and are easy to operate. When i choosed that bag my goal was also to have a bag that didn’t looks like a camera bag so peoples wouldn’t know i’m carrying a camera with me. So on some occasions i went to the Bank and stores and peoples said to me ” so you just finished working” when they saw that i had my bag they probably thought it was a Laptop inside with papers from my work. 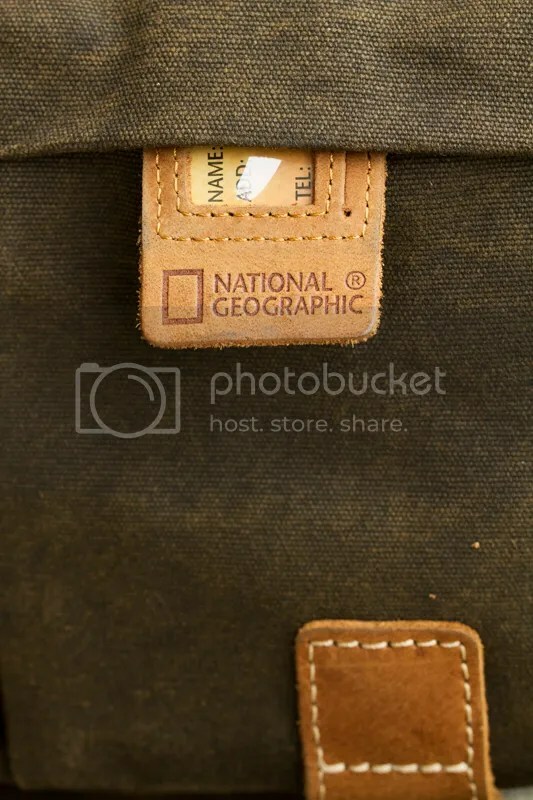 So if you’re looking for a well made, tough and practical bag that don’t look like a camera bag you should take a serious look at the Africa series from National Geographic! Gray Tree Frogs are out of the pond. 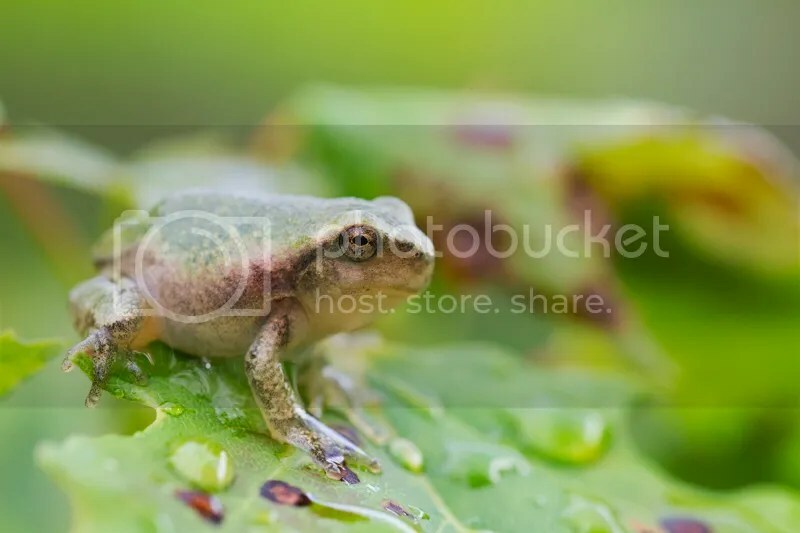 I was waiting for that moment with excitement, it’s the first time of the year that i went to the pond where there is a lot of Gray Tree Frogs, they are my favorite Frog that live here in my corner of the country (Canada). At this time of the year i’m looking for the young ones that just got out of the water, some still have a small tail. 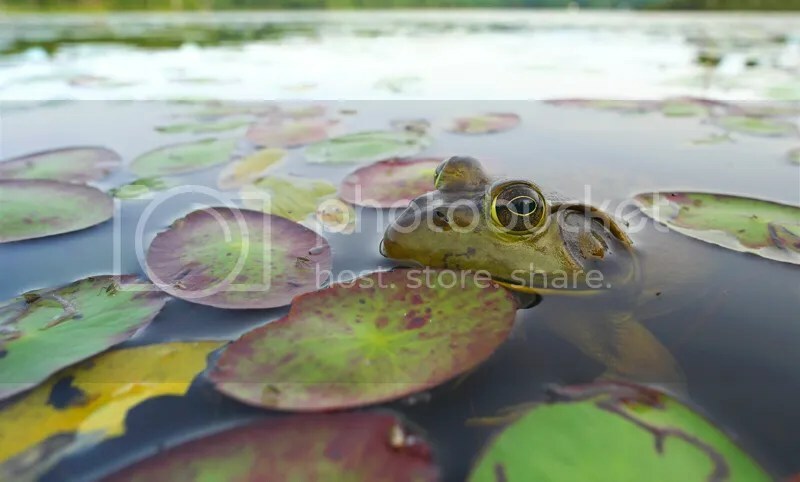 I have a favorite pond where i go every summer, it’s a Beaver’s pond, many species turns from tadpoles to juvenile Frogs at the same time (American Toad, Gray Tree Frog, Spring Peeper Frog and Leopard Frog). 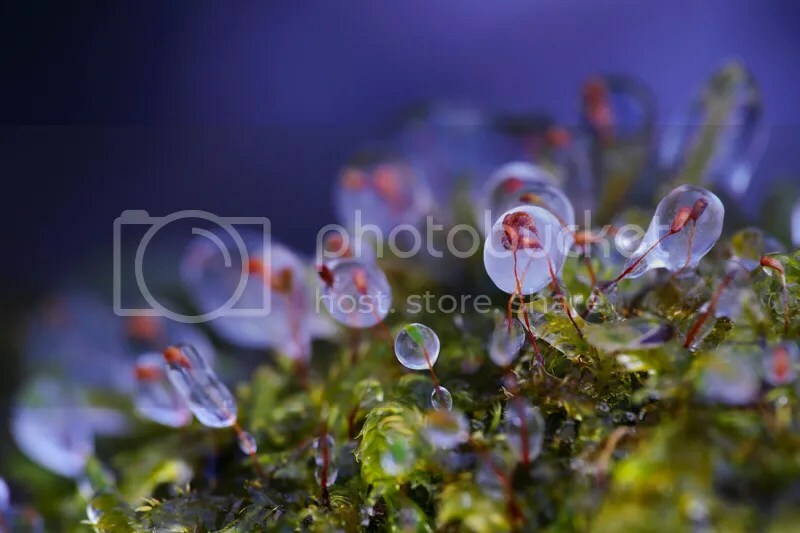 Those little fellows are quite small, about the size of my thumbnail, so a Macro lens is the best way to go and i would add that a lens with IS, VC, VR or a camera with IBIS is a bonus that help a lot since i often handheld my gear. 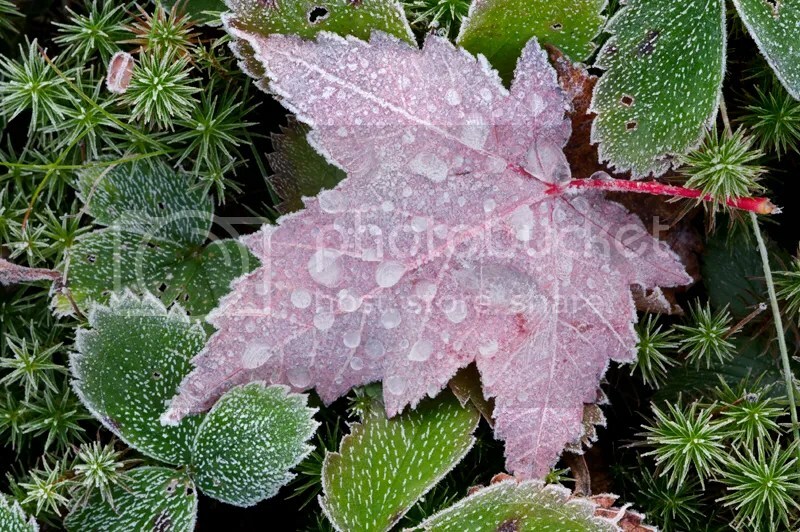 They are often hiding on plants where it’s difficult to get a good view and a tripod is not always practical. The King of the pond ! You can see the remaining of it’s tail. Just to give you an idea of how many Gray tree Frogs there is on the shore of that pond, i was standing among the vegetation and i was counting at least 30 Frogs around me hiding on the plants, i even saw 13 of them on a single plant. Sure i have a lot of subjects to choose from but often the background is busy so i have to find a Frog where the background is more interesting or less busy. With the combination of early morning, handholding the camera, wind and the need to blur the background i often end-up shooting from f/4.5 to f/5.6. I found this one hiding in a Pine, i was able to use my tripod and close my lens to a smaller aperture to have more DOF. The Spring Peeper Frogs juveniles are even smaller, some are the size of a fingernail. This one was walking on a leaf, i only got 4 frames before he jumped on another leaf.